Top windows are windows which are triangular FAP Z6, or arched FBP Z6. They can be installed on the join above any roof window. Top windows are non opening because they are made of special single wooden profiles. The windows are made together with flashings to suit flat roofing material (type S) and for profiled (type Z). The glazing unit consists of toughened external and internal glass. The internal glass has a low emission coating. Original shapes, additional lighting and an interesting interior design are without doubt the advantages of these windows. Use of top windows gives buildings a strikingly distinctive character. Manufactured with pinewood, vacuum impregnated and double coated with acrylic varnish. 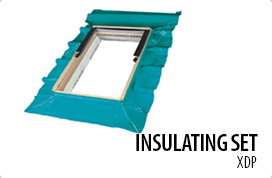 Suitable for roofs with pitches between 20-90° (when fitted with correct flashing).